Madden NFL 19: Hall of Fame Edition not only delivers advances to gameplay, but an excellent foundation for building an epic MUT roster. Pre-order the Deluxe Edition to earn one of five upgradable Elite Legends. Select either Terrell Owens, Brian Urlacher, Rod Woodson, Dan Marino, or Terrell Davis and add them to your lineup to start ruling opponents. Start with these players and continue to build your team with the included packs. The Hall of Fame Edition has everything you need to leave the competition behind starting on day one. 5 Gold Team Fantasy packs. REAL PLAYER MOTION: Built from the ground up, Real Player Motiontransforms the way you play Madden delivering game-changing control and precision on the field. Realistic character movements provide smooth, immersive animations for adaptive and believable player motion while animation variety creates authentic movementunique to positions and body types. Your favorite players become true-to-life from snap to whistle. Why tf is TO on the cover of the normal edition? TO on regular cover could just be a placeholder. I don’t recall any announcement of who is supposed to be on cover this year. I laughed, but then I remember they had Peyton Hillis on the cover. How in the world did that happen, btw? I know it was via fan vote, but he was a middling player playing for the Browns, was that just the ultimate troll job by the fans? He played 8 years in SF and had his best seasons there, and only played 3 seasons in Dallas (although they were decent). It says in this article, Per EA, there will be another athlete revealed as the Standard Edition cover athlete. And his only Super Bowl appearance was with Philly. IGN reviewed it and gave it an 8.9 out of 10. They said the story mode is disappointing and kind of a chore. They said it runs 3 1/2 hours long. 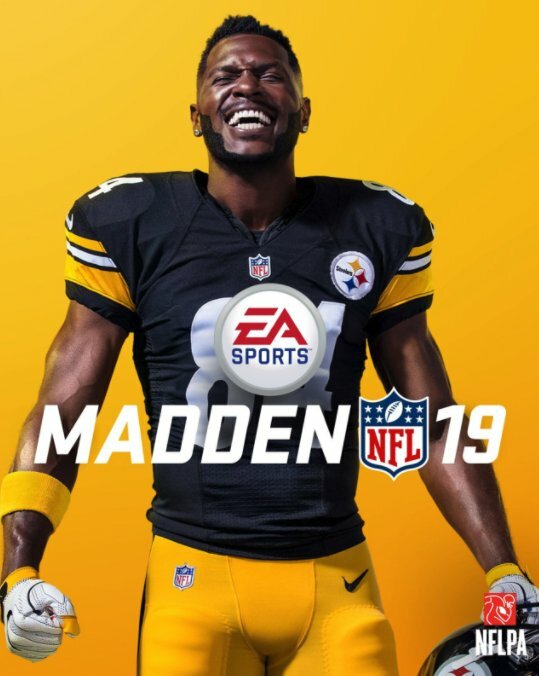 and for those unaware, the cover athlete of the regular edition is Antonio Brown. EA: Removing Colin Kaepernick's name from 'Madden' soundtrack 'an unfortunate mistake'. It doesn't help when the artist comes out and blasts them for doing it without any approval from his end. If you actually read the story instead of just the headline, it seems like an honest mistake. Since he's not currently on a roster, they didn't have the rights to use him in the game. The people in charge of adding the music to the game thought that the policy applied to lyrics as well, so they removed his name. It will be fixed in a day-one patch. Madden 19 is currently on sale for $39.99 at all major retailers. I guess most here didn't buy it. He should be on the cover as a 49er or Eagle with the SB Jersey. I guess EA thinks the Cowboys will sell more copies.